If two of the biggest comics in the world can’t support you, along with residuals from TV work, then I don’t know what hope any of us have. It has been very eye opening for me. You have the idea in your head that if you get a TV show you are set. Not so. Maybe if you have a hit TV show. A 15 minute show that plays at midnight does not pay much unless it sells a lot of merch and people don’t buy much Axe Cop merch. People like Axe Cop. They like to watch it, share it and laugh at it. But not nearly as many want to spend money on it. I can’t complain. Axe Cop has been (and will remain) great just as it is. Good luck with your other projects. I hope you, Malachai, and the rest in your family are doing alright? Yeah we are doing great. Just life moving along as it tends to do. It’s just financial choices. The money I make writing for TV is dependable and steady and good. Axe Cop money is random, sporadic, and showing up less and less as time goes on. I have to commit time to my steady income and to my future projects, and Axe Cop doesn’t fit into either of those right now in my life. There is a store link on the above menu. Some of the links are out of date but you can find the Mezco toys in various places and shirts here and there. We get happy for you, master, but a Little sad. Especialy those who discovered Axe Cop later on the run. It seens Malakay’s “youth” passed by too fast. So go, fulfill your dreams, and long live Axe Cop! Pingback: Bubbleblabber - The #1 blog for cartoon opinion, news, gossip, videos, reviews and interviews. In all honesty, the show may have ended as perfectly as the show could possibly have ended narratively and way better than most other shows. Flute Cop living in a mundane world completely failing at explaining to others the significance (let alone actuality) of Axe Cop’s adventures is so very…just. He becomes such a cassandric bard, perhaps the most seasoned bard ever but so? 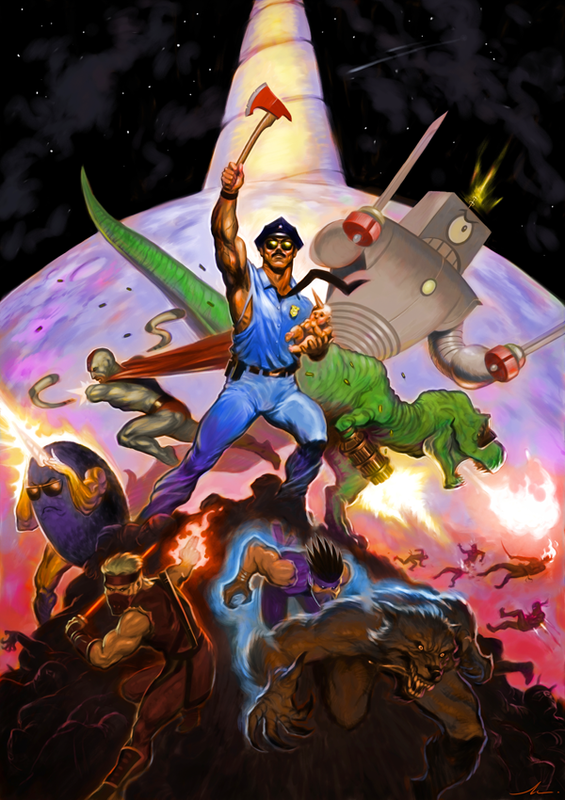 Plus, Axe Cop is exactly the type of person that could save the world but never living in a ‘saved’ world. With everyone on his ‘team’ serving a supporting purpose to Axe Cop (Grey Diamond guarding his soul, Wexter taking him to new adventures, Sockarang to be that guy Miyamoto Musashi dragged around to explain things to), I’m really comfortable with Flute Cop’s role being to tell others of the grandiosity of Axe Cop. That’s funny I didn’t think of it like that but you’re right. If that’s the last episode it does work well as a last episode. When can I Axe Cop: The Series on DVD? Oops, when can I buy Axe Cop on DVD? Just take my money. Wait, Axe Cop Season 2 is over?! But the episode where Baby Man’s dad appears (referenced in “American Choppers”) hasn’t aired yet! Could you clear something up for us, Ethan– how many Season 2 eps were made? Only 10 have aired. Yes, only 10 were made. I had always heard there would be 12 episodes but when the 10th was done, I was sent a “congrats on wrapping up season 2” email. So season 2 ended at Baboons Rising. Now, my thinking the show is over is just me talking. I didn’t think there would be a season 2 either, so I have been wrong before. But between not hearing any talk of a season 3 and season 1 ending early, it seems likely that there are at least no current plans for a season 3. But I don’t have much more info than you guys at this point. Ah, okay. Thank you for the clarification. I’m rather surprised they don’t keep you in the loop more than that. Well, thanks to you and Malachai for an incredible series! I enjoyed it, bought all the trade paperbacks, bookmarked the website, etc. It’s been one of my favorite things ever since I discovered it ~2 years ago, so it seems to me like it’s just ending so early. Best of luck to you, your family, and Malachai! Should we keep our hopes up for more motion comics? I saw that video of Dave DeAndrea recording lines for “The Ultimate Battle” early last year, but Rug Burn’s output has really slowed down since then, with only a single new cartoon so far this year. Now that you’ve got some experience and maybe some connections, you could pitch another cartoon idea. You’re a fantastic writer capable of coming up with new original ideas. I think Axe Cop works better as a comic than a cartoon. I think Chumblespuzz could translate really well into a cartoon. I don’t even remember how I stumbled upon Axe Cop, but I loved it from the moment I read it, and have been following his epic adventures ever since. I certainly understand Ethan’s reasons for not doing this on a regular basis anymore. But how about guest artists? There have been plenty of non-Ethan and Malachi Axe Cop stories over the years. I wonder if Ethan would allow another artist-kid team to take over the title for awhile. Or maybe a rotating “stable” of artists? Anyway it’s just a thought. Good luck with everything, Ethan! So does that mean Axe Cop is cancelled or is it still on hiatus? If there was a kickstarter for season 3 I would donate the **** out of it. Hi Ethan, I’ve recently discovered the AxeCop series (both TV and Comic), and I gotta say, I love it. Now, I read your recent post, and I suggest using AdSense (Small Google ads that pay big) on your index site, or to generate more revenue, on new comic pages. It appears to work for me, so hopefully it works for AxeCop. I’ve never had much luck making ample money with ads. I don’t draw the kind of numbers those kinds of things require. The ads I currently have don’t even cover the cost of the site. Thank you for giving a status. I fully understand why everything is on hold right now except for projects that actually pay off because family comes first. Though I hope you will pick up Bearmageddon when things look better; I thank you for what you have already done. Thumbs up! Thanks, I definitely want to continue Bearmageddon when I land something solid and feel safe to do so. I’m excited to get into the story where it is at, it’s really only just gotten started. On the off chance that two of the greatest funnies on the planet can’t bolster you, alongside residuals from TV work, then I don’t realize what trust any of us have. It’s a tough business, that’s for sure. And I’ve had it better than most. I don’t know if I could have done better with more marketing/business savvy. I’m not disappointed though, I assumed from the beginning Axe Cop would probably be a phase, not a life gig and I would try to crank out as much material as I could while we were in that special time. 6 volumes ain’t bad. I just recently found Axe Cop on Hulu. Ever since then, my friends and I have binge watched every episode which led me to Google “Axe Cop season 3” and leave this comment. It is single handedly my favorite TV show and it’s upsetting that it’s over. You and Malachai are comedic geniuses. I really hope to see more in the future! If not just know that you brought smiles to my friends as well as myself even during finals week. Thanks for this! I’m glad you have enjoyed it so much. 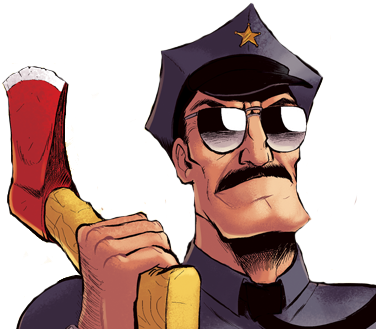 To be clear, there has never been an official announcement that Axe Cop is cancelled. I just don’t see any sign that it is continuing. So take that for what it is. To be honest I never thought a season 2 would happen either. You just never know. If there is a demand anything will be made, so tell your friends. In the meantime, read all the comics! Just took my Axe Cop hoodie out of the dryer (must-wear holiday gear) and realized I hadn’t checked the site in a while. Sorry to hear you guys are on hiatus, but it’s totally understandable. File it under Good Problems to Have. Merry Christmas, you crazy kids! Just took delivery of a great pair of axe cop raybans. Heres hoping for season 3 and thanks for the best cartoon on television me and kids love it. AXY was here & he will return to keep the peace! NEVER FORGET AXE COP! Axe cop was my absolute favorite show, maybe my favorite peice of comedic art 😭 it would be amazing if you could find funding for this show somehow, the diehard fans are still out there. Hell if i had the money i would fund it myself, theres always kickstart. Such is life; you have to make the right choices for your family. And, truth be told, it’s probably best to leave us wanting more Axe Cop, rather than cranking out so much that we grow tired of it. That said, I want to see more of BatWarthogMan. He’s adorable.